While I was on my pasta making kick, I also made some ravioli's. 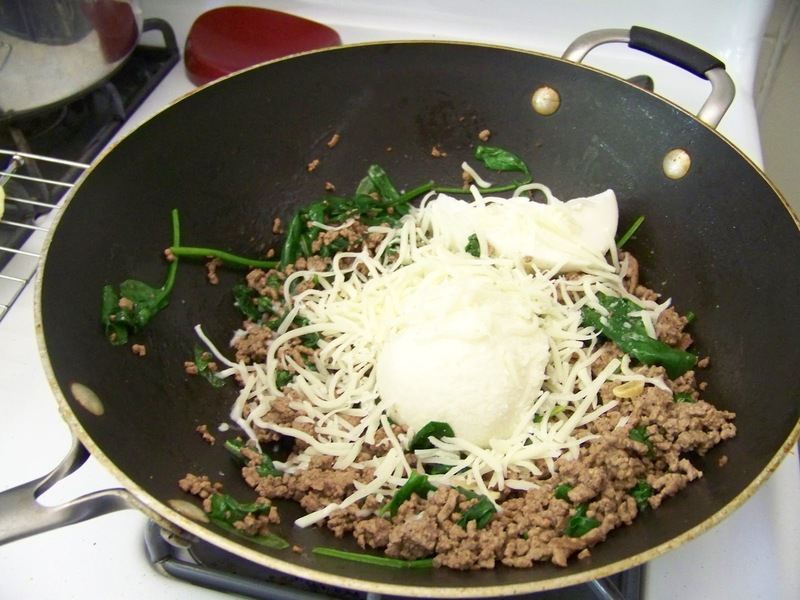 To make the filling, I browned some ground beef then added fresh baby spinach and cooked until the spinach was wilted. I added a scoop of ricotta cheese and about a quarter cup of mozzarella cheese. For the dough, this time I used 3 cups rice flour, 1 cup tapioca starch, 2 tsp xanthan gum, 1/2 tsp salt and 4 eggs. This amount made about 50 raviolis. 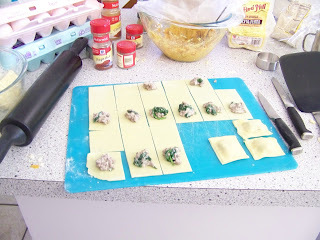 I combined the dry ingredients and then mixed the eggs in until dough formed. I actually froze all of these after cooking them for about 3 minutes and letting them cool (this didn't cook them all the way but apparently it isn't great to freeze this dough uncooked). 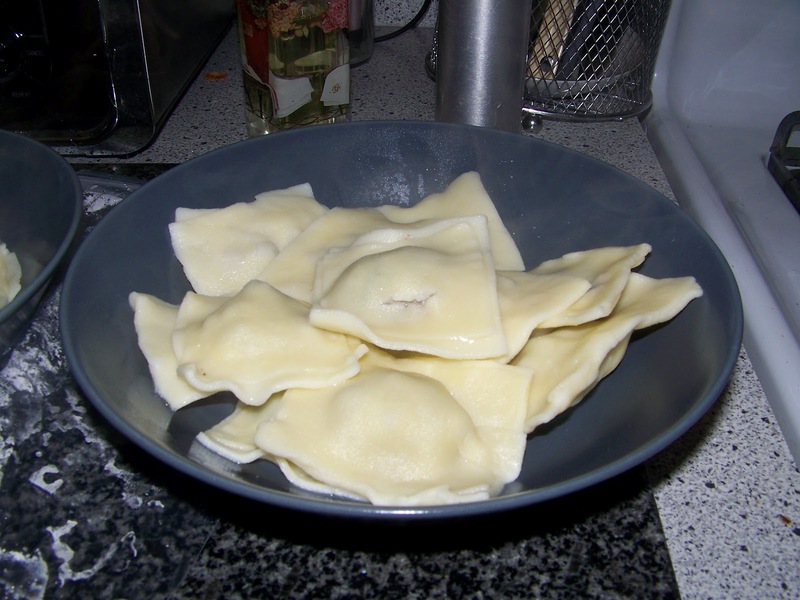 Then when we wanted them for dinner, we took them out of the freezer and threw them in a pot of boiling water for another 3 minutes to cook them the rest of the way. 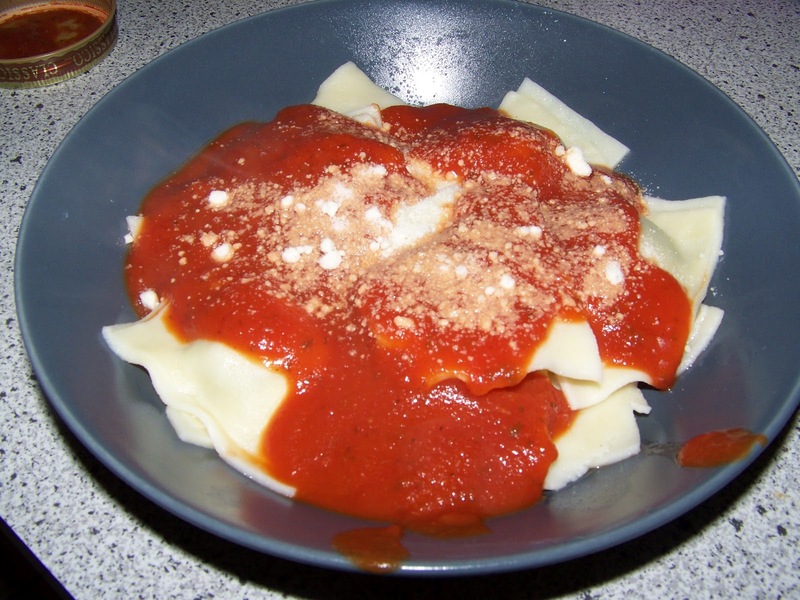 We heated up some marinara sauce to go with them and topped it off with some parmesan cheese. I actually wasn't as sure about this dough compared to the pierogi dough since the original recipe had 5 eggs listed for half as much dry ingredients (which now that I think of it is pretty ridiculous) so there was some major adjusting as I went. I was pleasantly surprised with how they came out. The dough was great and the filling really was tasty. I would definitely make these again and I would definitely recommend making a lot and freezing them. It takes a bit of time to make and If you're like us, the days you want ravioli, you DO NOT have the time to make them. Yippee! This is great timing. My daughter is coming home this weekend from university for Thanksgiving (Canadian Thanksgiving is in October). I wanted to make her something gluten free that she hasn't had before and this is going to be perfect. Thanks for the recipe! Found you from Creative Me link party.